Those looking for a free-to-play PC game in the style of Twisted Metal have a lot to be happy with Fender Bender. 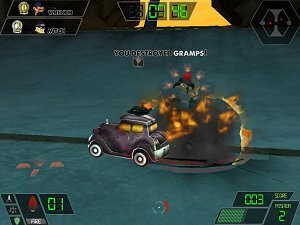 Although it was designed with the Xbox 360 in mind by a team of students from a Florida university, the PC version is now available and is great fun.Basically, this is a 3D vehicular combat game with some great modified cars, allowing for matches against the AI (choosing from three different difficulty levels) or between four human players in split-screen mode. An online mode would be awesome, though.Players get to enter two arenas that feature several levels and are chockfull of power-ups to restore health, speed up our vehicle or even the very useful shield. Guns range from machine guns and options such as rockets and heat-seeking missiles. The aim of the game, as you may already have guessed, is to destroy as many opponents as possible.Fender Bender offers a couple of game modes besides plain Deathmatch. Keep Away is the equivalent of Capture the Flag, with the player with the gold having to run away from the others for as long as he can. Smash & Grab tasks us with destroying our enemies and collecting gold.